There was a time during Western civilization when musing about worlds other than Earth could be life-threatening. In 1600 Giordano Bruno was burnt at the stake as a heretic for claiming, amongst other things, that the fixed stars were in fact suns with planets moving around them, and furthermore, that lifeforms similar to those on Earth might exist on these planets. 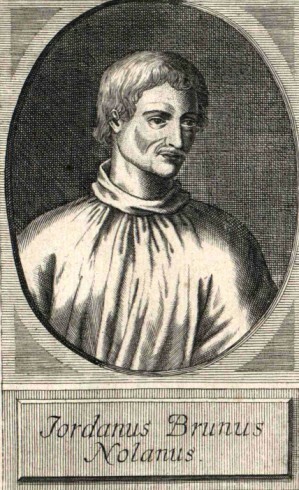 Although these ideas were not the result of scientific observation but rather of philosophical reflexions, Giordano Bruno is today recognized as the father of the idea of exoplanets. The study of planets revolving around distant stars has become one of the most thrilling disciplines in astronomy. As it did 400 years ago, this subject touches on the most profound questions of mankind, including the uniqueness of the planet Earth and even our own uniqueness as an intelligent species. As always in astronomy distance is an issue. While it requires a lot of patience to reach the planets within our own solar system, direct visits to exoplanets will not be feasible in the foreseeable future. Is there an alternative approach to find a second Earth? Nancy Kiang outlines what kind of information we can extract from the light that reaches us from distant exoplanets and how we could use it to answer the question: is life out there? Are we alone? Ancient astronomers across the continents knew the existence of five Solar System planets visible to the naked eye. They could tell that these celestial wanderers were unlike stars in that they only reflected light from the Sun. In the early 1600s, Galileo developed the first telescopes able to observe spots moving across the Sun and the passage of moons across the face of Jupiter. He verified the theory of Aristarchus (3rd c. BC), and refined by Nicolaus Copernicus (mid 16th c.) and Johannes Kepler (late 16th c.), that the Earth and the other planets, in fact, orbit the Sun and not the other way around. Around the same time, Dominican friar Giordano Bruno wondered about the possibility of life on other worlds orbiting other suns (and was burned at the stake for this and other heresies). Giordano Bruno was a Dominican friar who was the first to speculate about other worlds different from the Earth. In 1593 he was tried for heresy by the Roman Inquisition. Because he refused to recant his cosmological views he was eventually burned at the stake in Rome in 1600　(Image credit: Public Domain). Fast forward to 1992, when 9 planets of the Solar System had long been common knowledge (except the smallest would later be downgraded to a dwarf planet), and at long last, astronomers discovered for the first time a couple of planets in another solar system, around three times the mass of Earth, detected through the gravitational wiggle with their parent star . Only a little over a couple of decades later today, the Kepler space telescope, by observing the transit of planets across the face of their parent star, has ballooned the catalogue of verified exoplanets to 3,457 (as of 13 April 2017; for regular updates see http://exoplanet.eu or http://exoplanetarchive.ipac.caltech.edu/), and counting. The planets range from gas giants to rocky planets smaller than Earth, planets with wild elliptical orbits around their star and those so close to the star that their year is only a few Earth days long. This burst in discoveries of exoplanets has scientists scrambling to characterize the trove of unprecedented data, and to figure out how to answer the golden question: which of these planets might bear life? Robotic missions to Mars and Europa are designed to analyze in situ samples for substances of life. But for exoplanets, we need to understand the conditions and signs of life amenable to remote detection. Scientists of all stripes are needed to contribute their expertise to this endeavor: astronomers to find and observe the planets and their stars; planetary scientists to understand a planet’s formation and relation to sibling planets; climatologists and atmospheric chemists to figure out the temperature and gases in a planet’s atmosphere; biologists who know which kinds of life can survive where; biogeochemists who can say how the chemistry of life transforms the planet; Solar System scientists who can teach lessons from Venus, Mars, and the moons of Jupiter and Saturn; and Earth scientists who can draw from our only example yet of how different life forms can dominate a planet at different points in its history. Scientists cannot stay cozily in their own fields, but are being forced to consult with each other. And brainstorm together. What can we actually see? Although so many planets have been discovered, there is limited data about them. The array of telescopes currently available to astronomers has each contributed bits and pieces of the picture of exoplanet demography, according to the limits of their respective technologies. The radial velocity technique, used for that very first exoplanet discovery with the Arecibo radio telescope, can detect exoplanets only indirectly, and only infer a planet’s mass and orbital distance. The transit method, which is used with the Kepler space telescope, tracks how the light from a star dims when a planet passes in front of it, and can be used to estimate a planet’s radius and the length of its year. This favors planets with fast orbits close to cool M dwarf stars　, which are not too bright to obscure the planet (it takes 3 orbits to confirm that a planet has actually been detected – so in the lifetime of an astronomer, it is easier to confirm a planet that only takes a few days to orbit the star). Left: The Kepler telescope (artist's impression) is a NASA space observatory launched in 2009. Its mission is to detect Earth-like exoplanets in the Milky Way. It has been highly successful and identified already well over 2,000 exoplanets. Right: Exoplanets are typically detected through the transit method where the minute dimming of a star's luminosity is measured when the planet passes between the observer and the star (called a transit; Image credits: NASA). The transit method can also observe the star’s light filtered through the planet’s atmosphere. If the telescope at the same time can resolve the colors of light, it can give information about that atmosphere’s chemical composition. The wavelength range of the telescope – ultraviolet (UV), visible, near-infrared (NIR), mid-infrared (MIR) – restricts which chemicals can be detected. So far, the resolving power of available telescopes has enabled observation of such atmospheric spectra for only large, Jupiter-size planets . Kepler has spotted many Earth-size and smaller planets, but cannot resolve their transits spectrally – but we know they are there. The next telescopes being built now or slated for development are expected to provide spectral characterization of the atmosphere of planets as small as Earth size. Strenuous design efforts are going on to get the direct image of an Earth-size planet – as a single dot, but with spectral characterization. It’s hard. The James Webb Space Telescope (JWST) is not quite designed to observe planets, although astronomers are calculating what they can eke out of it. The European Extremely Large Telescope (E-ELT) is a ground-based telescope with spectrograph instruments being built right now in the Atacama Desert in Chile. Construction of the E-ELT began in 2014…but first light will be not till 2024. It will be able to identify gases in the atmospheres of rocky habitable planets, and get direct images of gas giants　, but direct images of the rocky planets will be a challenge. 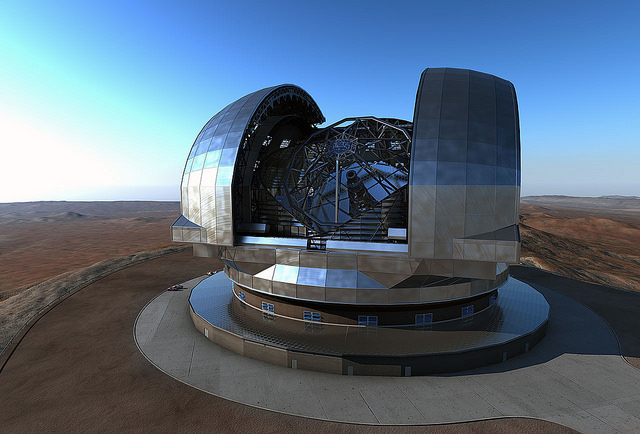 The European Southern Observatory's E-ELT (artist's impression) with its 39 meter primary mirror will be the largest of the next generation of optical ground-based telescopes. It is currently under construction in the Chilean Atacama Desert at an altitude of more than 3,000 meters. It is expected to provide images 16 times sharper than those from the Hubble Space Telescope (Image credit: ESO). Coronagraph technology – in which the light of the star is blocked by a disk to see a closely orbiting planet (as you might shade your eyes from the Sun) – theoretically could do the job for small, Earth-size planets, in the visible and NIR wavelengths. NASA has had a few versions of designs that have been tabled, as not quite up to the task, or just way too expensive. But new designs are in the works. The idea of a starshade – a large occulting disk maneuvered thousands of kilometers from a space telescope – once seemed exotic, but now may be a welcome inexpensive option to augment the capabilities of telescopes soon to be available or to be developed in the future. These new designs are unlikely to get off the ground before the 2030s. But there is a lot of precursor science to do before then. The data will not arrive all at once, so scientists have to take what they can get. With all these bits and pieces of data, what kinds of planets are we most likely to observe, and what can we infer about them? Perhaps we have already detected signs of life in another solar system. The star KIC 8462852 was discovered in 2015, exhibiting very strange characteristics: the star’s light fluctuated in a manner that could be consistent with the existence of a “Dyson swarm” around it . A Dyson swarm is a theoretical massive array of collectors built to encircle a star to capture its energy – a sign of life with advanced technology! But other possibilities could be a swarm of comets, or even a destroyed planet. No actual home planet has been detected, yet. So, no firm conclusion can be drawn, except to say that the phenomenon is unexplained, and more data are needed. Astrobiologists and exoplanet scientists are anxious not to miss any potential kind of life that might be out there. But limited funding also compels them to aim to observe where they will have the best chance of success: the planets that have the best probability to be not only habitable but also detectable with currently achievable technology, and with the most likely types of life. So far, planetary scientists have been able to narrow down some characteristics of potentially habitable planets. They must be rocky. That is, small enough to avoid being ice giants like Neptune or gas giants like Jupiter. That size limit appears to be up to about 1.6 times the Earth’s radius. Then “habitable” in the simplest sense of the word, means that the planet’s distance from its star gives it sufficient radiation to allow a surface temperature that can support liquid water – not so far away as to freeze over like Pluto and not so close as to evaporate away to a runaway greenhouse like Venus. The star-planet distance only gives a rough ballpark assessment, though. Climate scientists are doing computer simulations to explore how a planet’s rotation rate (its day length), obliquity (the tilt that gives Earth its seasons), greenhouse gases in its atmosphere like CO2, continental configuration, gravity, and even geothermal heat can influence its climate. This information will help astronomers determine in what region around a star to look for plausibly habitable planets. A small number of planets less than twice the size of Earth have been discovered in their star's habitable zone by the Kepler space telescope. These planets are plotted relative to the surface temperature of their star and with respect to the amount of energy they receive from their star in their orbit in Earth units. The sizes of the exoplanets (and of Venus and Mars) are indicated relative to Earth. 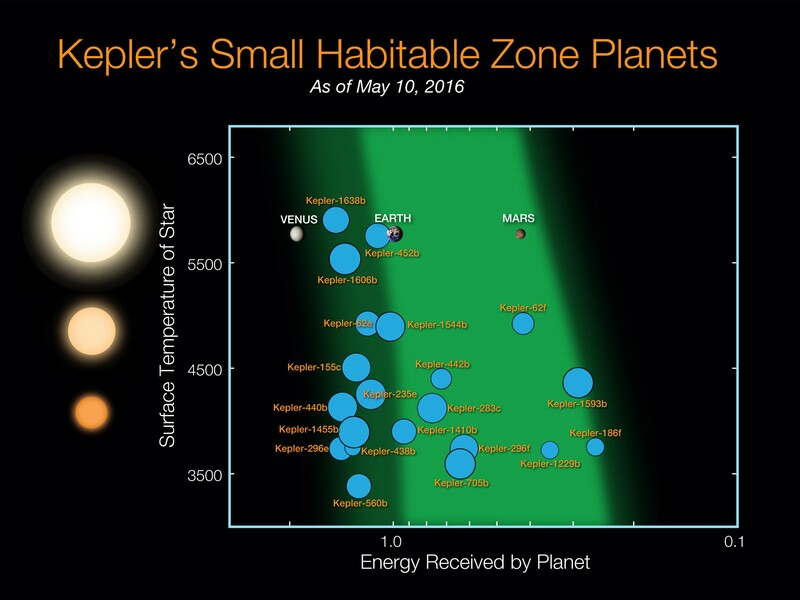 The light and dark green shaded regions indicate the conservative and optimistic habitable zone respectively (Image credit: NASA Ames / N. Batalha and W. Stenzel). The spectral type of the parent star affects that climate balance, too: our Sun is a yellow G-type star　, and the radiation from bluer K stars or redder M stars interacts differently with a planet’s atmosphere and surface reflectance. Right now, telescope technology makes it easiest to find rocky planets at habitable distances from the parent star if the star is an M star. Stellar astronomers can tell that M stars emit relatively more near-infrared radiation than visible light, and climate scientists show that water (both vapor and liquid) tends to favor absorption in the near-infrared. So, on an M star planet, that would keep the planet warmer at further orbital distances (up to a point, at which the atmospheric structure reaches a tipping point and the planet gets cold again). The evolutionary history of the star and planet will determine the planet’s current observed state. Geophysicists and planetary system scientists are working on the problem of how a planet might initially form with a chemical composition giving it the potential building blocks for life. A young M star would produce strong ultra-violet flares that could potentially strip a planet of its atmosphere – but then the flares would die down as the star ages, and the atmosphere could be restored through planetary out-gassing or lucky deliveries from asteroids. During the long life-time of the M star, the planet might even migrate to a different orbit, with one or the other being more favorable to life　. 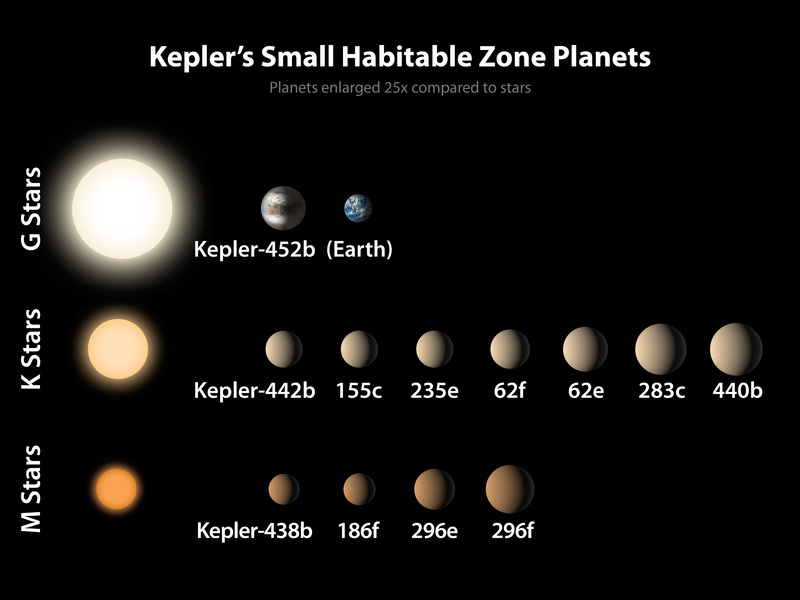 A handful of the exoplanets discovered by Kepler are Earth-like planets, i.e. they are less than twice the size of Earth and reside in the habitable zone of their host star. The sizes of the exoplanets are indicated relative to the size of Earth and are enlarged by 25x compared to the stars. The exoplanets are arranged by size from left to right, and by the type of star they orbit, from the M stars that are significantly cooler and smaller than the sun, to the K stars that are somewhat cooler and smaller than the sun, to the G stars that include the sun (Image credit: NASA Ames /JPL-CalTech / R. Hurt). Suppose that momentous discovery is made: an exoplanet that definitely has liquid water! Then how can we tell if life is there? The scientists of the Search for Extraterrestrial Intelligence (SETI) project have been speculating about the technologies for alien civilizations building structures in the interstellar medium or producing communication signals. However, most of the exoplanet exploration funding is being put into looking for chemical and physical signs of life on a planet: particular gases in the atmosphere and reflectance signatures on the planet’s surface. Different kinds of these are produced by primitive microbial life versus more complex life and even advanced technological civilizations. Microbes had to come first. Paleogeologists tell us that after our planet formed 4.6 billion years ago (Gya), the first fossil evidence of life was not until 3.6-3.8 Gya. Single-cell microbes dominated our planet in the oceans until about 1.9 Gya, and multi-cellular plant life did not make it onto the land until only around 460 million years ago. For nearly 90% of the time that life is known to have existed on our planet, the organisms were microbial. Geochemists point out that these tiny organisms over that time had huge impacts on the chemistry of the Earth. The earlier organisms also made it possible for those that came later. When we observe exoplanets, we see snapshots of their evolutionary trajectory. So, if the succession of life on Earth is a good rubric for other planets, our best probability of detecting extrasolar life is through the chemical impacts of microbes, that is, bacteria and archaea　. Geologists know from the fossil rock record that the early Earth had no oxygen (O2). Geochemists explain that it is very hard for oxygen to stay around in the atmosphere on a lifeless planet, because, if there is liquid water, oxygen gets rained out of the atmosphere and reacts quickly with rocks. The fact that we have abundant oxygen to breathe is thanks to the persistent activity of early cyanobacteria – the ancestors of land plants – doing photosynthesis in the oceans: splitting water molecules (H2O) to get electrons, energizing those electrons with light, and using them to perform biochemical reactions to eat the carbons in CO2, and release O2 to the atmosphere (note: the O2 released does NOT come from the CO2 but from the H2O!). That build-up of O2 in the atmosphere started to show up in the rock record around 2.4 Gya. It led to our protective ozone layer, made it safe for plants to colonize land, made it possible for oxygen-breathing mobile animals to eat those plants and run around, and introduced a bio-geo-chemical cycling of the elements unlike what had existed on Earth before. Thus, oxygen, in the presence of liquid water, is a strong sign of life, and telescopes are being designed to tell if an exoplanet has it. But it is not sufficient to know a molecule is produced by life. It might also be produced abiotically. Oxygen could build up in the atmosphere of a watery planet if the parent star, like a young M star, produces high intensity ultra-violet flares that could split water vapor and cause hydrogen to escape, leaving behind O2. Microbial ecologists tell us that methane (CH4), some sulfur gases, and nitrous oxide (N2O)　are produced by bacteria, but geologists tell us they are also produced geologically, and atmospheric chemists tell us that N2O is produced by lightning. Deciding if a gas is a sign of life requires atmospheric chemists to know how big is the rate of production as well as destruction from both biotic and abiotic processes. Astronomers and geochemists need to provide the stellar-planetary context, and microbial ecologists estimates of plausible biological flux rates. For example, oxygen makes up 20% of Earth’s atmosphere – such a large amount cannot occur from hydrogen escape given our planetary setup, so the source must be a life process. N2O from lightning is miniscule on our planet, so any significant amount of N2O must also be from life. The presence of one gas alone may not be conclusive, but a suite of different gases together can corroborate if one or more is biogenic. Or a biogenic gas might be present, but in so low abundance that it is hard to detect, while its photochemical byproducts could serve as indicators it is there. The simultaneous presence of O2 and CH4 would excite scientists: CH4 should get destroyed quickly by hydroxyl (OH) radicals from H2O vapor, so if it is there with O2, both must be produced by life. Meanwhile, on planets where there is very low UV flux (which generates the OH from H2O), biogenic gases like methyl chloride (CH3Cl) that also normally are destroyed by OH might build up to higher concentrations and be easier to detect . On the early Earth, during the Archaean period 3.8-2.5 Gya, there was no atmospheric oxygen, yet life existed. But so far scientists have not quite been able to identify a strong biosignature gas for this period. The archaea microbes produced methane, no different from geologic sources. Bacteria also produced organosulfur gases that are solely biogenic, but which are quickly destroyed in the atmosphere. A byproduct hydrocarbon gas, ethane, also has geologic sources. If we were to encounter an Archaean-like exoplanet, the relative balance of these gases might tell us if they are biogenic. Prior to the methane-producing archaea, the Earth’s atmosphere had more CO2; the fossil record tells that the activity of archaea drew down the CO2 and increased the methane. Computer simulations reveal that this atmospheric chemistry may have made the Earth hazy orange with smog. Such computer models synthesize understanding of the coupled climate-biogeochemical system of a planet. They can be used to explore different physical and chemical processes driven by different stellar inputs or surface gas fluxes or orbital dynamics to see what overall chemical mix should emerge, with versus without biology. It is hard to constrain the gas fluxes from the various sources, though. Sometimes, the modelers must wait for a lab chemist to measure the reaction rates of some peculiar gases, because they were never considered important to measure before. Until there are more confident answers, there’s the risk of encountering a planet with life and being unable to tell. An alternative to searching for gaseous biosignatures is to look for the effect of life on the surface of a planet. Microbes during the Archaean produced a variety of biological pigments: anoxygenic photosynthetic bacteria could have been purple in color due to bacteriochlorophyll; salt-loving archaea could have been purple to bright red, due to bacteriorhodopsin, and oranges and yellows due to carotenoids. The shades of these colors are a bit variable, though, so microbial ecologists together with remote sensing scientists still have to work out when certain colors are plausible, how widespread they might be, and if there are mineral mimics. But these surface pigments might serve as biosignatures when there is no clear atmospheric sign of life. With complex vegetation on land, we get a twofer: the photosynthesis that produces oxygen also results in a reflectance spectrum of plant leaves that satellites can see from space. Plant ecophysiologists and remote sensing scientists show that plants absorb visible light with pigments (primarily chlorophyll a) but strongly reflect NIR. That contrast, called the “vegetation red-edge”, is so consistent and different from any rocks that it is regularly used to map vegetation. If the Earth were to be observed as a dot, like an exoplanet, that contrast would also be detectable at the global scale (when not too cloudy). A signature like the vegetation red-edge could help corroborate an atmospheric signal of O2, if there were any doubt about the O2 being biogenic. Simulated albedo spectra　of Solar System terrestrial planets as single dots as might be seen by a telescope. The Venus spectrum is a simulated average solar illumination and viewing angle. The Mars and Earth spectra are from fully-spatially resolved 3D models that have been averaged to a telescope view . The Earth spectra show the Earth at two different illumination angles using satellite-observed Earth cloud coverage during March 2008. The gibbous view has most of the Earth fully illuminated over the Pacific Ocean. The quadrature view is less illuminated but the Sun's rays have a longer path through the Earth's atmosphere, which gives more pronounced absorption by most gases, including ozone (O3) at 0.5-0.7μm, water (H2O) at several wavelengths, and oxygen (O2) at 0.687 and 0.761 µm. This view also shows the more richly vegetated North and South American　continents and the vegetation red-edge: note the selective increase of reflection in the NIR (starting at about 0.7 µm) when viewing richly vegetated areas (quadrature view) in comparison to the water surface of the Pacific Ocean (gibbous view). The Earth's relatively higher reflection in the shorter wavelengths is known as Rayleigh scattering due to the size of gas molecules, which gives the sky its blue color. By contrast, iron oxides on the surface of Mars absorb in the blue and reflect relatively more in the red (0.6-0.7 µm), giving the planet a red color. Venus shows especially strong absorption by carbon dioxide (CO2), and Mars, with its thinner atmosphere, slighter CO2 absorption (Image Credit: The Virtual Planetary Laboratory, Victoria S. Meadows ; updated by Jacob Lustig-Yaeger). A false-coloured infrared image from ESA's Sentinel-2A satellite showing irrigation systems in the Saudi desert. This satellite spans the spectrum from the visible to the infrared including the "vegetation red-edge" in the NIR. This part of the spectrum (which is invisible to the human eye) is shown in red. Measuring the vegetation red-edge not only allows for a precise quantification of vegetation surface coverage but also for a more subtle analysis of vegetation state such as crop type or leaf water content (Image credit: ESA). However, for another star with a different light spectrum for photosynthesis to use, the red-edge might not be red. Even on Earth, underwater algae receive light that has been filtered by water and other organisms so they have additional light harvesting pigments that exhibit different colors. Only in the past two decades, novel cyanobacteria have been discovered here that have swapped out chlorophyll a with another pigment, chlorophyll d, which allows oxygenic photosynthesis to be performed with far-red and NIR light . These cyanobacteria live in hidden niches, receiving left-over light from chlorophyll a organisms, but they challenge old assumptions about the light color limits for oxygen-producing photosynthesis. And their light niches are spectrally like what would occur on planets orbiting red dwarf M stars . More varieties of far-red/NIR cyanobacteria are being discovered, with pigments absorbing even further into the NIR . Molecular biologists, biochemists, and biophysicists have their work cut out for them, to figure out rules for what pigment colors are likely to proliferate on a planet with alternative stellar spectra, so that the astronomers will know what to look for. The wonderful diversity and complexity of life on Earth provides a smorgasbord of potential biosignatures – and rules for their alternative expression – for exoplanets. The highly interdisciplinary fields of astrobiology and exoplanet science, however, are still in their infancy in identifying and confirming what is and is not a biosignature. The most robust, confirmed, planetary-scale biosignatures are oxygen and the vegetation red-edge from photosynthesis. But because there are cases where O2 may occur without life, and since the red-edge may change with the stellar context, scientists recognize that the environmental context matters in how life is expressed and in how observations are to be interpreted. The same risk of false positives and false negatives must be considered for other potential biosignatures as well. Last year, in a brute force scouring of chemical databases and the literature, a team comprised of an astronomer, a biochemist, and a biotechnologist identified over 600 gas molecules known to be produced by life , and thousands more containing the building block elements for life, C, H, N, O, P, and S. Some of these molecules could be byproducts of biogenic molecules after environmental post-processing or could be produced by technology. Most do not register a blip in our atmosphere, but on another planet some might be detectable. This was a first search, limited to molecules with 6 atoms (not counting the hydrogens), and stable at standard temperature and pressure for Earth. Fully characterizing the physico-chemical properties of these molecules – how they are produced, their reaction rates, their stability under other temperatures and pressures – will be a huge job, but it will provide much needed data so that the modelers can calculate what the ultimate composition of gases could plausibly be given the climate and photochemical reactions on a particular planet. The vetting of alternative surface signatures to the vegetation red-edge is only just beginning. Biological pigments are made not only to harvest light but also to shield against UV, function as anti-oxidants, signal other organisms, acquire nutrients, and other purposes that may have nothing to do with their color . Surveying these other pigments, including hundreds of carotenoids made by archaea, bacteria, fungi, algae, plants, and even animals, understanding their synthesis pathways, evolutionary origins, environmental adaptations, and identifying their abiotic mimics will take a concerted effort similar to that needed for volatile molecules. The chiral nature of biological molecules is being scrutinized for its effect on the circular polarization of light – results get noisier going from organisms to ecosystems to the global scale, but the investigation is ongoing. If one walks the ornate halls of the Natural History Museum of Vienna, observing its dense displays of 19th century taxidermy collections in room after room of antelopes, koalas, ostriches, and cases of insects, one is reminded how that period was an age of exploration and discovery, and enthrallment with the as yet unknown diversity of life on Earth, only just beginning to be explained through Darwin’s travelogues from his voyage aboard The Beagle. The science of planetary biosignatures is at this early stage of discovery. Instead of sailing ships, our vehicles are telescopes and spacecraft. Instead of dredging with nets to haul up strange creatures from the bottom of the sea, our methods span the molecular to planetary system scales. We now have databases of genetic information that eluded Darwin, but metagenomics expose that we have sampled and characterized still only a small fraction of total microbial diversity. The Kepler mission has produced a wealth of statistics on abundances of exoplanets, but gaps remain to be filled. The next mission that might spectrally characterize those planets small enough to support a rocky composition for life will still be a long while coming, and will challenge our ability to interpret the data. Recent discoveries of novel organisms on Earth make it clear that our planet hosts yet more analogues for life on planets with exotic environments. At this stage, scientists need to sample widely for heretofore unknown kinds of life as well as experiment on the computer with planetary climatologies, to develop new frameworks to discuss and understand them. Now is considered a Golden Age for Astronomy, as the extraordinary capabilities of space observatories advance our understanding of the universe at an intense pace. Discoveries continue to emerge apace, getting ever closer to that Goldilocks planet – or already having found it, but just needing more data to confirm. The planet Proxima Centauri b, discovered in August 2016, is comfortably at a rocky planet size, maybe a bit cold but potentially habitable, orbiting a red dwarf star, 4.2 light years from Earth　. In February 2017, scientists using the Transiting Planets and Planetesimals Small Telescope announced the discovery of no less than seven planets orbiting the very dim red dwarf TRAPPIST-1. Of these, four are rocky, and three are at orbital distances that might make them habitable. Another very promising candidate for a second Earth is LHS 1140b orbiting another red dwarf star, LHS 1140, about 39 light years from Earth . It also seems to lie in the habitable zone of its sun. The radius of LHS 1140b was measured to be 1.4 that of Earth and its mass determined to be 6.6 times that of Earth, consistent with a rocky bulk composition. LHS 1140b therefore is called a temperate rocky super-Earth. Because our view of the TRAPPIST-1 planets and of LHS 1140b from the Earth allows us to see their transits past their star, scientists hold high hopes for atmospheric characterization of this extraordinary array of planets by future telescopes, such as the JWST, and the ground-based E-ELT. These discoveries tantalize scientists so much, perhaps we might forgive the occasional hubris when some error estimates turn out to be too large amid the rush to sift the holy grail from the treasure chest. However, the number of confirmed planets continues to grow and fill out the gaps in our understanding, in parallel with other scientific and engineering advances. Perhaps these are all converging toward that inevitable discovery that may answer: Are we alone? It may happen in our lifetime. Way MJ, Del Genio AD, Kiang NY, Sohl LE, Grinspoon DH, Aleinov I, Kelley M and Clune T (2016) Was Venus the first habitable world of our solar system? Geophysical Research Letters 43: 8376-8383. Kiang NY (2014) Looking for life elsewhere: Photosynthesis and astrobiology Biochemist 36: 24-30. 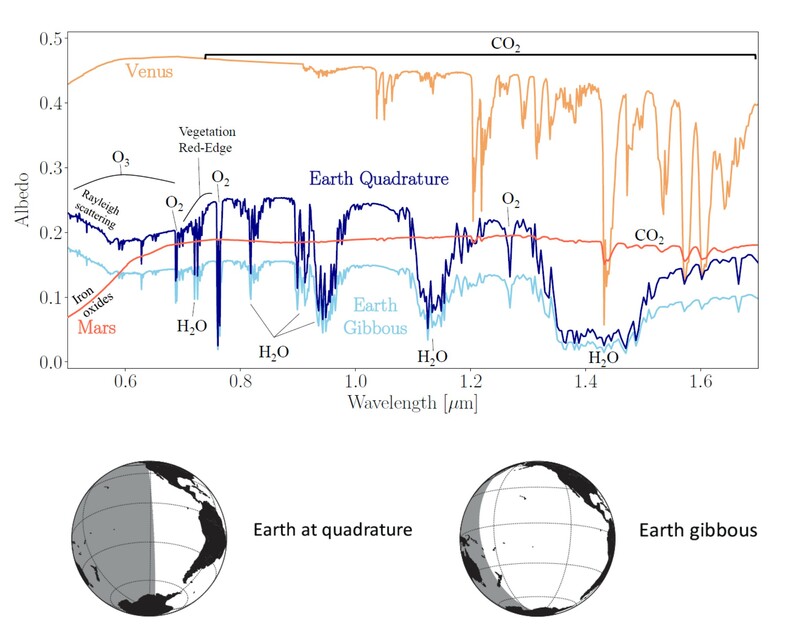 Kiang NY, Siefert J, Govindjee and Blankenship RE (2007) Spectral signatures of photosynthesis I: Review of Earth organisms Astrobiology, Special Issue on M stars 7: 222-251. 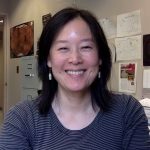 Nancy Y. Kiang is a research scientist at the NASA Goddard Institute for Space Studies. She conducts research into the interactions between the Earth's biosphere and its atmosphere, and investigates how “biosignatures” from photosynthesis might be used to detect life on planets in other solar systems.